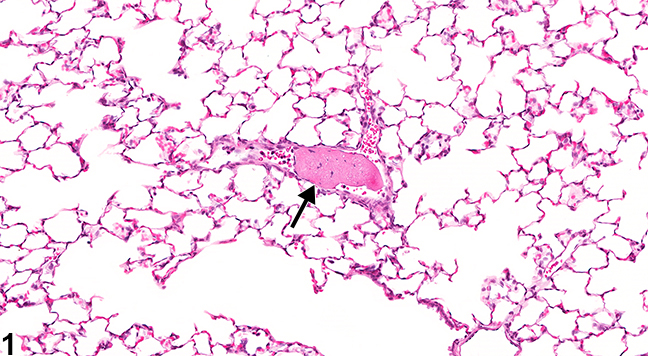 Lung, Artery - Thrombus in a female F344/N rat from a subchronic study. There is an aggregate of eosinophilic, fibrillary material within a pulmonary artery (arrow). 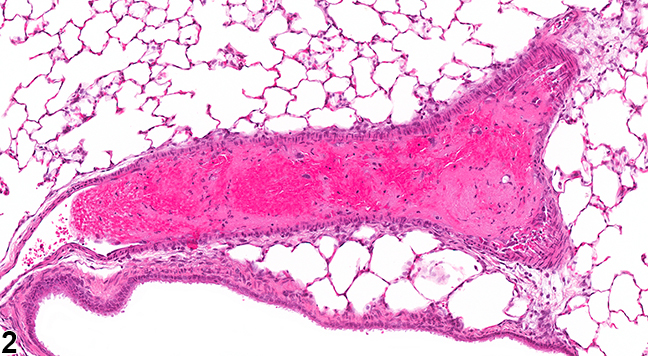 Lung, Artery - Thrombus in a female F344/N rat from a subchronic study. A thrombus containing a large number of erythrocytes is present in a pulmonary artery. 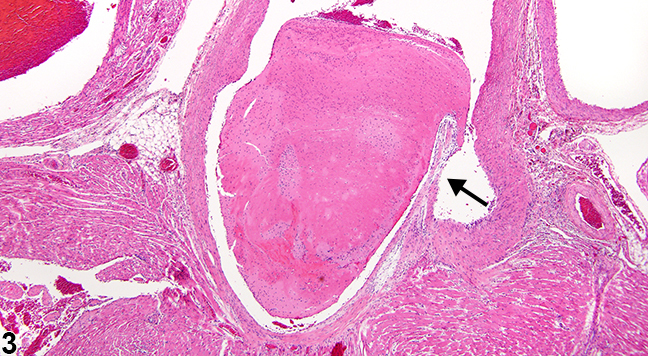 Aorta - Thrombus in a female F344/N rat from a subchronic study. This thrombus is attached to the aortic valve (arrow). A thrombus is an intravascular aggregate of fibrin and platelets, usually in laminated layers, that is attached to the vessel wall or valve. Leukocytes and erythrocytes may also be present in the thrombus. Thrombi are most often found in large and midsize arteries and less commonly in veins. With maturation, thrombi undergo organization and recanalization and may contain varying amounts of fibrous connective tissue or dystrophic mineralization. Thrombi are of clinical importance due to occlusion of vessels and loss of blood supply leading to infarction, particularly in organs that lack collateral circulation. Portions of thrombi may also break free and give rise to emboli, which may occlude distal vessels. The three main events leading to the formation of thrombi are endothelial injury, altered blood flow, and hypercoagulability, of which endothelial injury is the most potent contributor. The most common cause of thrombosis in rats occurs as part of the spectrum of lesions in polyarteritis. In mice and rats, thrombi may occur as a background lesion in the atria of the heart, in the ventricular lumen, or in larger cardiac vessels. Introduction of foreign material into circulation may give rise to emboli, ultimately leading to thrombosis. Several examples of this phenomenon exist, including intravascular hair shafts noted in mice receiving intravenous injections. Similarly, intravascular injection of stem cells has been shown to produce pulmonary emboli and eventual thrombosis. Whenever present, thrombi should be recorded, with the organ in which it is present listed as the site and the type of blood vessel affected (e.g., artery or vein) indicated as a site modifier. If the type of blood vessel cannot be determined, the site modifier "blood vessel" may be used. Lesions in protocol-required great vessels, such as aorta, should be recorded with the blood vessel as the site (e.g., Aorta - Thrombus). Thrombi should not be graded. If an infarct is present secondary to the thrombus, it should be diagnosed separately as necrosis. The relationship between an area of necrosis and a thrombus should be discussed in the pathology narrative. Katsuhiko Y, Kissling G, Johnson JA, Clayton NP, Flagler ND, Nyska A. 2005. Chemical-induced atrial thrombosis in NTP rodent studies. Toxicol Pathol 33:517-532. Maxie MG, Robinson WF. 2007. Cardiovascular system. In: Jubb, Kennedy and Palmer's Pathology of Domestic Animals, Vol 3, 5th ed (Maxie MG, ed). Saunders Elsevier, Edinburgh, 63-65. Mitsomori K. 1990. Blood and lymphatic vessels. In: Pathology of the Fischer Rat: Reference and Atlas (Boorman GA, Eustis SL, Elwell MR, Montgomery CA, MacKenzie WF, eds). Academic Press, San Diego, CA, 475. Ramot Y, Nyska A. 2007. Drug-induced thrombosis -&nbsp;experimental, clinical, and mechanistic considerations. Toxicol Pathol 35:208-225.